It has finally come. The final group of prospects that I will be looking at. The last group will be the big boys on the Offensive Line. I have included guards and tackles in this group. I have only focused on mid round to late round prospects. It is harder reviewing these guys because most of them are down low because they don't have the technique of those in the top rounds. These guys are development players that won't be able to start right away. For this reason the guys I am looking at are the physical freaks. The guys with massive, powerful and athletic bodies. I would expect at least one guy to be picked in this years draft, it may or may not be from this group. Either way lets get into it! First to breakdown the numbers. For guards I like them around that 6-3 mark, I believe and find it harder for guards to bend and play the position when they are over 6-5. For the tackles I like them 6-6+. All need to be over 300 and closer to 320 pounds. The 40 yard dash is irrelevant, unless your a guard that needs to pull lots. But you want to see the OL guys run close to 5s and nothing really over 5.3s. 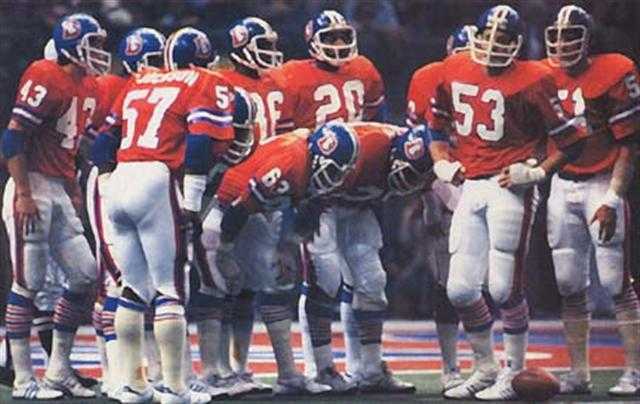 The more important aspect for these guys would be the 10 yard split, the quicker the better. 3 Cone Drill is not important. The Bench I believe is very overrated for O-Linemen but you like to see these guys throw the bar up there in the 20s and 30s. The vertical and broad are not needed for these guys, all of them generally do bad in this anyway. The really important measurement for the offensive linemen is the arm length. The big that is the better. For the offensive tackles they need to be 35+ inches. This makes it easier for them to get they hands on the defensive ends/pass rushers. On tape you want to look for things like their power at the point of attack. Do they take a backwards step or go forward. Do they use their hands well and can get them on pass rushers. What does they kick step look like. 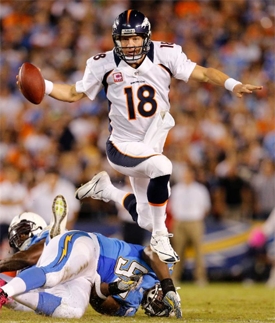 Like I said above do they show power and athletic ability. For these guys this will be hard to see. The reason I picked most of them was for their frame, athletic ability and potential. Everything that is said about these guys would be a projection on their development. Finally to the prospects. 40 Time: 5.25. 10-Yd Split: 1.77. 20 YD Shuttle: 4.87 secs. Hand Size 9 3/4 inch. Washington was part of a mass exodus of juniors at Miami who declared for the draft early, although he has had four years playing experience since high school after a year in prep school at Milford Academy. He was a consistent, durable starter on the line for Miami in his last two years and didn't miss a game. He held down the left tackle position on a team with very talented tackles in their stable. He may need time to develop into a starter, but he has fourth- or fifth-round value. Teams who are willing to let him develop slowly could find value in him as a guy who could be a starter at right tackle down the line. Brandon Washington, Miami, 6-3, 320...Washington is a stout, get-it-done lineman who played guard and tackle at Miami and will play inside at the next level. He is one of four siblings raised by his single mother in a tough Miami neighborhood, where he played three years at Edison High then finished on Miami Northwestern's talented national championship team. Rated one of the top preps in the country, Washington needed to attend Milford (N.Y.) Academy to become academically eligible for Miami. He has improved each year and is a brutal blocker on runs, but still needs work to recognize variables presented by various alignments and pass-rush techniques. At Miami, he started 15 games at left guard his first two years and 12 at left tackle last season. He was penalized only eight times in 1,727 offensive snaps. Washington is a big man who carries a lot of weight in his upper body to be an effective positional blocker. He excels as a down blocker on run plays and is comfortable working within a zone scheme to pass off and pick up stunting defensive linemen. He has very good feet for his size, which he showcases when working upfield as a puller. 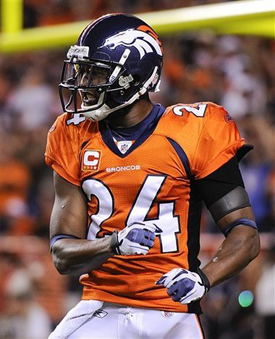 He is an explosive hitter who can uncoil on his man and generate a lot of movement. Washington looks as if he shoots out of his stance at times into his man and would have no problems playing in an up-tempo, no-huddle offense. Washington struggled at times in 2011 in his pass set, where he showed inconsistent footwork and had difficulties getting a good base to anchor himself. He is not very strong in his hands and has difficulties engaging with his man for extended periods of time; he could have trouble blocking within a traditional offense that demands extended protection. His technique will need a lot of work so that he isn't a victim of wasted movements and balance issues. Washington did not perform well at the Combine, but did not have a disastrous performance either. He would have been better off returning to school and improving before entering the NFL. 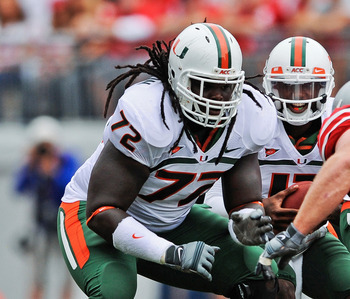 After being a 2010 All-ACC pick at guard, Miami moved Washington to left tackle after Seantrel Henderson was injured. Washington had a mixed season at left tackle. He did a quality job of run blocking for Hurricanes running back Lamar Miller. Washington has a nice combination of power and mobility, but he belongs on the inside. Head coach Al Golden was openly critical of Washington after he struggled against North Carolina and defensive end Quinton Coples. Washington took offense at his coach's criticism, but remained the starter at left tackle. He has some talent, and his situation at Miami led him to entering the draft. In the NFL, Washington definitely has to move back inside. My Opinion: He may not be the smartest and he may have issue with coaching/criticism. He has a solid nice body, he may need to add more muscle in his lower legs and be more powerful but he is solid and compact. He has Ok footwork, not the fastest. He is pretty good on the run and decent kick step as a tackle but definitely a guard in the NFL. He needs more use of the hands. He needs to center and balance and keep his pad level low. Looks really big on tape. I wouldn't mind Washington on our team, he is big and strong plus deceptively athletic. In the 4th or 5th that would be great rounds for him. Looney is a strong interior lineman from Wake Forest who has been consistent for the Demon Deacons since stepping on campus. He is an athletic mover who blocks well in the run game and has great size. He has fourth-round value based on his production and ability to be inserted right away. Joe Looney was a celebrated offensive tackle in high school, ranking 21th nationally by scout.com, and averaging over 10 pancakes per game as a senior. Looney has been a four year starter at OLG for the Demon Deacons, including starting as a true freshman by mid-season. Looney has missed a few games over the years with minor injuries, but finished strong, receiving second team ALL ACC in 2011. 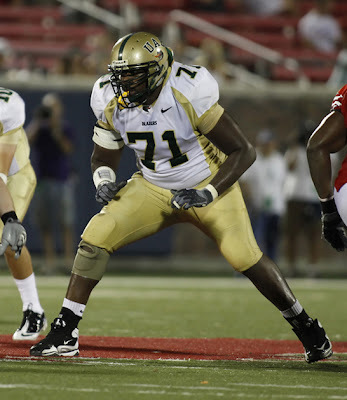 As an NFL Draft prospect, Joe Looney offers very strong hands and light feet, and is very effective on the move. Definitely an OG, Looney has a powerful upper body with a somewhat longer and thinner lower body. As a result, Looney is high hipped, and doesn't bend his knees well. Looney has been able to get away with that flaw at the FBS level because his hands are dominant and he usually gets a first contact. When the defender is able to get below Looney's high pass protection set, trouble happens, including against top competition like Clemson's Brandon Thompson and Mississippi State's Fletcher Cox. Looney would appear to best fit in a pulling guard scheme like Washington, because he really does extremely well on the move, with attitude. Strengths: Tremendous power, especially in hands - superior punch. Gets hands on defenders and jolts/moves/pancakes. Can fire off the snap and drive defenders off the LOS. Light on feet, agile, can get to second level and block moving targets. Durable, productive, smart, enthusiastic, experienced team leader - top intangibles. Weaknesses: Top heavy, and as a result doesn't bend really well, and struggles changing directions and stopping double moves. High natural set in pass protection can be exploited by short, quick DTs. Was effective, even dominant, in college by relying on just his powerful hands a lot, and may not be able to get away with that in the NFL. 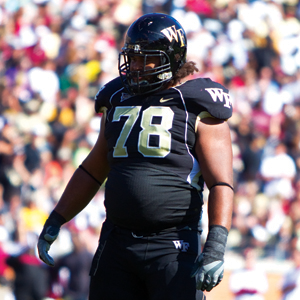 Looney was Wake Forest's highest-rated offensive lineman in 2011, grading out at 86 percent for the season and leading the team with 79.5 knockdown blocks. Looney is very experienced as a four-year starter. He is a tough run blocker who moves well. Looney is more athletic than one might expect and gets to blocks on the second level. He needs to improve as a pass protector for the NFL. Looney is a sleeper prospect who could transition to a zone-blocking system or a power-man scheme. A solid senior season earned him an invite to Tampa to participate in the East-West Shrine Game, where he had a good week of practice. However, an ankle injury kept Looney from working out in Indianapolis or at Wake Forest's pro day, and there are some concerns he might not be able to reach full health before draft weekend. A possible mid-round pick, he will fall down draft boards if he's not able to show scouts his ankle is at full-go. My Opinion: I could not find any tape on Looney. But he has all the measurements that you want and was a dominate blocker while at wake Forest. He could be a surprise prospect. 40 Time: 5.24. 10-Yd Split: 1.77. Vertical: 31.5 Broad: 108.0 inch. Hand Size: 10 1/4 inch. Rishaw has been a tough and consistent starter for small-school Cal U in Pennsylvania. He is a transfer from Ole Miss, and there are questions that arise from his departure there. He is a reliable backup option early as an athletic big body, and he has fourth-round value. Rishaw is a good run blocker who sticks on his blocks and is quick to get into them off the line. He shows a pop to jolt back defenders. He has good foot quickness in pass protection and is a technically sound interior lineman. Some teams will not like his dismissal from Ole Miss, but some will see it as a way to get an athletic player late in the draft because of how it affects his value. 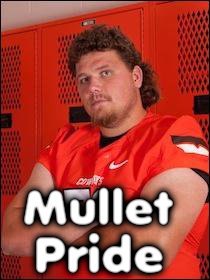 He is an unreliable pass protector and has to work in close quarters to be productive. Johnson had a good week of practice at the East-West Shrine. He was gritty blocker who showed a combination of power and quickness. Johnson received a late invitation to the Senior Bowl, where he had some struggles with the increased competition. Johnson took some snaps at center but did not perform well at all snapping the ball, so he should be viewed as a guard only. Johnson had some off-the-field problems that got him kicked out of Ole Miss after he had multiple suspensions prior to his dismissal. Offensive guard Rishaw Johnson (California, Pa.) has shown why some feel he could be a top-120 pick. He has good thickness throughout his body and moves very well for his 309-pound frame with large, 11-inch mitts. Johnson, who has been practicing at right guard, spent a little too much time on the ground and is a bit of a bull in a china shop, but he stays balanced off the snap and looks to finish. He has some off-field questions, but showcased the raw skills in practice to develop into a pro backup, at worst. 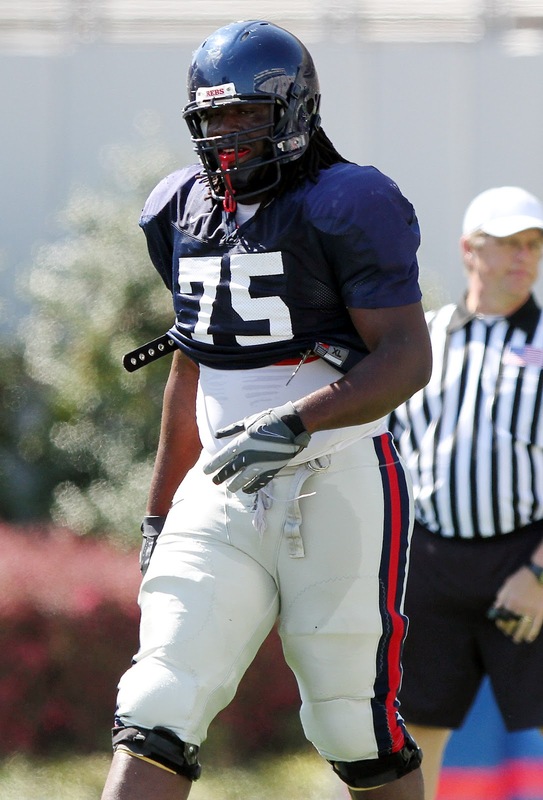 Johnson was named a D2Football.com First-Team All-American in 2011 after playing the last three seasons at Ole Miss. The senior started 12 games at right guard this season after being voted a team captain. Johnson helped anchor an offensive line that allowed only 17 sacks while setting school records for pass attempts and passing yards. A native of Louisiana, Johnson is one of only two NCAA Division II players (Janoris Jenkins, North Alabama) invited to the Senior Bowl. My Opinion: He had some off field problems while at Ole Miss but I think he has been clean since then. Plus he has huuugggeee arms for a guy 6-3. He is a bit fat in the gut. He has a decent frame though. He has monster legs, they are so thick. His frame in all is odd, he has huge legs and a little bit fat in the gut and needs to get bigger in the shoulders. He barely has any footwork, doesn't possess any of the stuff you would expect for a tackle. Tape was also hard to find for this guy. Johnson has an odd freaky body and barely any technique. The perfect clean slate to develop and build on, he won't have any bad tenancies to rework. I think he would be an interesting prospect late in the draft. Arm: 33 3/4. Hand: 10 1/2. Blackwell held his own at the Senior Bowl and had a quality week, but he did not get invited to the Scouting Combine. Blackwell had a strong senior season opening up holes on the ground for LSU. He also was a good pass protector for his quarterbacks. Blackwell was LSU's starter at right guard for the 2010 season. He has some developmental potential and should get cross-trained at center. He was a first-team All-SEC selection this year. 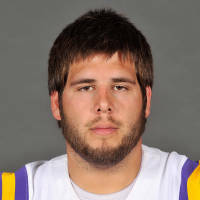 Will Blackwell, LSU, Sr., has been selected All-SEC Conference First Team for the 2011 college football season as voted on by The Associated Press. Blackwell and Hurst started all 13 games for the Tigers and paced the team to 2,797 rushing yards and a school-record tying 35 rushing touchdowns. They also anchored a line that led the SEC by only allowing 14 sacks this season. My Opinion: I found nothing on Blackwell. I included him here because I like his size and the fact he can play center too. It will be interesting to see where he goes and how he does. A decorated three-sport star in high school who gained 30 pounds his senior year, Adcock is a late bloomer who took the junior college route to Stillwater. He coasted as a sophomore at OSU but made a stronger commitment in 2010 and '11 with the athleticism and long-term potential to attract teams in the later rounds. Positives: Good natural athleticism, knee bend and fluid lateral movement to mirror college defensive ends. Willing to attack and punches multiple times to finish the play. Quick to pick up edge blitz and shows no panic, easily adjusting angles and resetting his feet. Can recover and reset his anchor. Rarely late off the snap. Negatives: Stronger pass rushers can get under his pads and steer him aside. Lacks elite foot quickness and wasn't asked to block in space often. Misses moving targets but makes an effort to recover. Adcock was not at the Senior Bowl or the Combine, and that was surprising too many. He reportedly had a good showing at his pro day and is projected to go early on the third day of the draft. 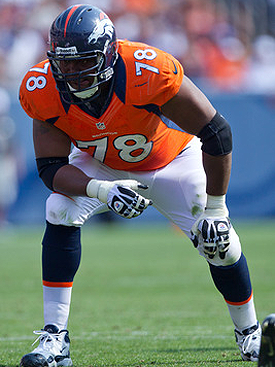 Injuries forced Adcock to flip back and forth between left tackle and right tackle in 2011. He had some inconsistencies and gave up some pressure and sacks this year. Adcock concluded the regular season on a high note with an impressive game against Oklahoma and defensive end Frank Alexander. Alexander was shut down by Adcock, and Oklahoma State rolled its rival. To cap his collegiate career, he played well against Stanford in the Fiesta Bowl. Adcock looks like a bit of a plodder with heavy feet. Against speed rushers, there are plays where he is reaching after them, and he does not display the quickness to shuffle and mirror. Adcock should play at right tackle or possibly guard at the next level. In speaking to some scouts about him, they also are back-and-forth on Adcock and where he should play in the NFL. There is a consensus that Adcock should not play left tackle. It would have been helpful if he had played in the Senior Bowl. OL Levy Adcock, Oklahoma State, Sr., has been selected All-Big 12 Conference First Team for the 2011 college football season as voted on by the league's 10 head coaches, who are not permitted to vote for their own players. Vertical: 25.5. Broad: 97.0 inch. McCants is a late-round value pick as a developmental project at the tackle position. He has the natural size and frame for the next level, but will need to put on some weight to hold his own against bigger NFL defensive ends. He is an on/off type player who will show NFL starter traits one minute, and barely UAB starting traits the next, but overall he has late-round value based on his potential and could continue to rise as the postseason progresses. McCants is a very good positional blocker who has fluid hips. He has the body control to get up in a defensive lineman's face, and if he falls off, can recover and continue to shuffle and mirror to keep position. This serves him better in pass protection, where he hardly ever allows a sack in his conference, but he can struggle at times in the run game, where he is not a very strong or explosive player. McCants is athletic when moving in space and plays much better when pulling or sealing than when playing in a phone booth, which could make him a guard prospect in the eyes of some NFL teams. 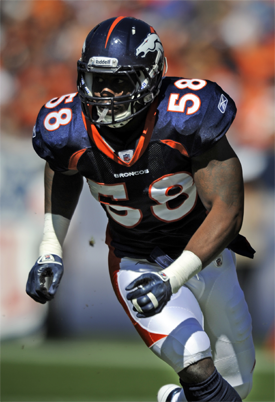 McCants is not a very strong athlete and played the majority of his career under 290 pounds. He will need to put on a good deal of size and strength to block and compete at the next level. He struggles when coming out of a three-point stance and has displayed some very telling and troubling tendencies throughout college which could scare NFL teams. He is not very technically sound with his hands, and all these things come together to make a serious project for the team that wants to develop a big frame into NFL-ready skills. McCants had a quality season, but he was part of a line that gave up a massive game to Marshall's Vinny Curry. McCants has some athleticism to have a shot at being a developmental project. He had a mixed week at the Senior Bowl. Overall though, the week in Mobile helped McCants' stock considering that he was making a big leap in the quality of his competition. McCants has long arms, and that is a hinderance in the weight room but a plus on the field. Still, his bench press total at the Combine was extremely low. My Opinion: He has great arm length, but his frame is a little thin. He needs to get bigger and stronger. He has decent footwork but a slow kick step. He can pull but needs to get stronger though. He is not overly quick moving around. First Adcock now McCants hahaha...classic. Hand Size: 11 1/4 inch. 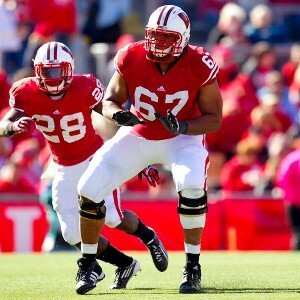 Oglesby has been a consistent performer on a very good offensive line at Wisconsin. He has the frame and experience of playing on an NFL-caliber line and protecting a pro prospect QB such as Russell Wilson. Although he is not quite the prospect as some of his Badgers classmates, he has late-round value in the draft and will likely be selected by a team looking for a reliable backup early on. Oglesby has great size for the position. He is a good positional blocker who relies on his size to stay with his defender but also understands how to position himself to stay competitive. He is technically sound and wouldn't be a liability in pass protection. He understands how to use his hands, but isn't explosive by any means. Oglesby is a positional, big-bodied blocker who isn't talented athletically. He labors at times to get his frame moving and could struggle against top-tier defensive ends. Oglesby had a disappointing Combine. 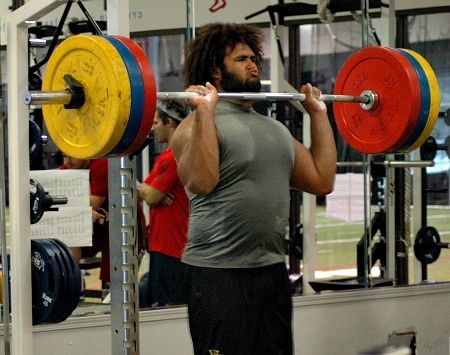 He ran very slowly and had a low bench press total for what was supposed to be a power right tackle. That pushes him further down on the third day of the draft. However, Oglesby had a strong senior season with a lot of good tapes for NFL scouts. He had a very good showing against Nebraska. In both Michigan State games, Oglesby was beat on some plays, but the redshirt senior also had some very good plays. He was absolutely dominant in many of Wisconsin's wins. Oglesby demonstrates surprising mobility to get downfield while also executing his bread and butter as a road grader in the run game. All year, he opened up holes for Montee Ball and James White while doing a good job of protecting Russell Wilson. Against Illinois, Oglesby was beat by Whitney Mercilus for a sack-fumble. A speed rusher like Mercilus is a mismatch for Oglesby. Consensus first-team All-Big Ten … winner of team's Wayne Souza Coaches Appreciation Award … Played in and started 12 of 13 games at right tackle … missed the South Dakota game due to injury. My Opinion: I could not find any tape on this guy but I don't know why he isn't rated higher. He is a monster! Big everything ;) I would not mind taking a look at him late in the draft. It has been completed! Another year another huge group of prospects. I hope you all enjoyed and now on to the draft! ~ Aussie. I will have the Draft completion post up tomorrow. I will rule you in the draft comp. Join in if you dare Jazzy. Anybody else out there wanting in on this?